Thassos, Thasos, Limenas, Limenaria, Potos, Macedonia, Makedonia, Travel Vacation Greece. Thassos, one of the most green and beautiful islands in Greece, lies in the gulf of Kavala just 8 kilometres from the mainland. With 98 kilometres of coastal road around the island, wonderful scenery, sandy beaches, fishing villages and mountain settlements such as Panagia, are all waiting to be explored. Three centres, the capital Thassos Town or Limenas as it is also know, Potos and Limenaria. The buildings of Thassos Town cluster round both new and charming old habours. The ancient remains of the town, including a small theatre, afford idyllic views over the town. There is a wide choice of tavernas and cafes and the town boasts a good beach. 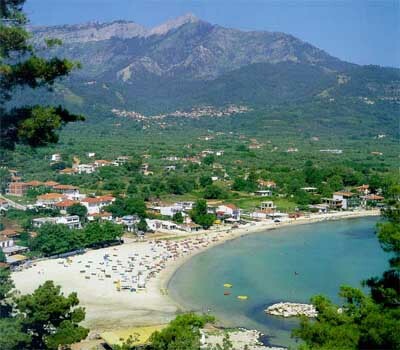 Thassos Town is the ideal base to explore Thassos Island. On the south coast of the island we feature the area around Potos, a reasonable sized village with amenities and good beaches. We would recommend car hire if you consider staying in this area of the island. Last, but not least, Limenaria on the west-coast is the second largest town on the island. Facilities are good with many tavernas and cafes. Beach lovers will adore Thassos Island and relaxation is easily achieved, but we feel some time should be taken to tour the island either by car or an organised coach excursion to appreciate the scenery beauty. A very good circular road enables easy travel around the island’s coastline. Along its length, whilst rarely losing sight of the sea, you will encounter thickly forested mountain scenery, traditional villages, working fishing ports, seaside resorts, and many sandy beaches. You don’t need to hire a car to do this - the bus service operates a ‘round-island’ service up to five times a day. The capital of the island is in the north, and the best place to base yourself for general exploration. From here ferries run very frequently to the mainland and so sites such as Pillipi, just to the north of Kavala. Being the largest settlement, although by no means a metropolis, Thassos Town has the greatest variety of shops, caffee, bars and restaurants. As almost everywhere on the island, it has its own sandy beach. The east coast has the best scenery mountains meet sea here – and some fine beaches. Chrissi Ammoudia (Golden Beach) is probably the best, although now a developing resort area. Paradise Beach, halfway down, is naturist. The small sandy inlet of Aliki has the remnants of a Doric temple on its headland and is popular with photographers and caique trippers alike – it is certainly pretty. But the best beaches are in the far south, which boasts a string of gloriously sandy bays. Here is the island’s second town, Limenaria, and the two smaller resort villages of Potos and Pefkari. The gentler western coast has olive trees, beaches of its own and a procession of fishing villages. Inland, built high in the hills for protection against marauding pirates, there are some beautiful old villages to seek out. Traditional Thassian villages, rather like those in the Pelion, have grey-slate roofs, a cool central square, mountain springs and lush vegetation. The local tavernas here serve simple, honest and fresh fare. Theologos is worth a visit – it was the old medieval capital – and from Potamia walkers will enjoy the path leading up to the summit of Mount Ipsarion, at 1200 metres the highest point of the island. Being so close to the mainland, Thassos is popular with Greeks for their own summer holidays, and the small resort areas can be busy for a four week period in July and August. But the island is large enough, and has so many miles of sandy beach, that it manages to absorb this influx with greater ease than many smaller islands. Thassos is famous for its honey – beehives are much in evidence – and marble is still quarried today. It is an island of great natural beauty, a distinctively Greek atmosphere, and with much to offer away from the beach.